Bile salts enhance the digestive action of lipases by breaking down fat globules into smaller droplets in a process called emulsification. This increases the surface area where lipases can act. Bile salts are synthesized by hepatocytes and are secreted in bile which mixes with chyme. Bile salts are derived from cholesterol. Cholesterol is hydrophobic but when converted to bile salts possess a number of oxygen containing polar groups that are hydrophilic. Because all the polar groups are located on one side of the molecule, the molecule is amphipathic. The bile salts break up the fat globules into smaller hydrophilic coated droplets that more readily mix with water. Pancreatic lipases work on the lipids on the surface of the lipid droplets by breaking the bonds of fatty acids on either end of the glycerol backbone. The fatty acids and monoglycerides are released into solution. Of these end-products of digestion some are absorbed by the epithelial cells while others remain in aggregations called micelles. This report summarizes the actions within the gastrointestinal tract when eating different types of lipid complexes; triacylglycerols, phospholipids and ethyl esters. Furthermore what happens during lipid malabsorption, affecting the overall uptake of lipids and lipid-soluble vitamins and carotenoids. In addition, this report also includes a summary of today’s knowledge of studying the lipid absorption in vivo, and the different biomarkers which are suggested to mirror the intake of n-3 PUFAs. Lipids in food are found in several types of different lipid complexes, with the most abundant one being the triacylglycerols (TAGs), built from one glycerol molecule and three fatty acids (FA)  (fig. 1). These lipid complexes are hydrophobic, meaning they are in-dissolvable in water, a property which affects their transport through the water-rich environment within the gastro-intestinal tract (GIT). Based on this the ester bonds of the TAG need to be hydrolysed, leading to the formation of free fatty acids (FFA) and monoacylglycerol (MAG). FFA and MAGs are more hydrophilic, making them easier to dissolve in water, consequently increasing the absorption within the small intestine. Due to their hydrophobic nature, most dietary fat exist mainly as emulsions where the lipid droplets are stabilized within the water rich environment by amphiphilic lipids and proteins . Amphiphilic meaning that the molecule has a water-soluble group attached to a nonpolar, water-insoluble hydrocarbon chain, making them go into the interphase between the lipid and water, dissolving the lipid. The FA has a wide range of different chain lengths, degree of unsaturation and different FA isomers. In general, a fatty acid contains 2-24 carbons (C) , with one carboxyl group (COOH) at one end, and a methyl group (CH3) in the other end, commonly named ω/n. Double bindings could also be included in the chain making unsaturated FA; monounsaturated FA (MUFA) if only one double bond is present, and a polyunsaturated FA (PUFA) if there are ≥2 double bindings present . The PUFAs are further classified as either n-3, n-6, n-7 or n-9 PUFAs; dependent on the position of the first double bond counted from the -CH3 in the fatty acid. Both the length of the carbon chain, as well as the presence of double bonds, will affect the characteristics of the FA. 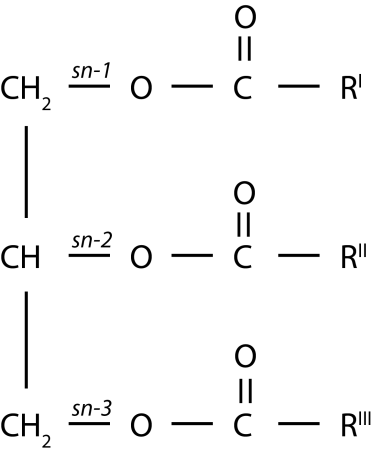 Within the triacylglycerol (TAG) similar FA could be placed in different positions, named sn-1, -2 and -3 (Fig. 1). As an example of this, the position of the long chained (LC) n-3 PUFAs eicosapentaenoic acid (EPA) and docosahexaenoic acid (DHA) on the TAG is dependent on the origin of the lipid. EPA and DHA are located mainly in sn1 and –3 in marine mammals, while they are enriched in sn-2 position in TAGs derived from fish . Previous studies have shown that PUFAs might have beneficial effects on several metabolic risk factors in humans [4, 5]. The beneficial effects of the LC n-3 PUFAs are suggested to be partly due to reduction of serum TAGs and by decreasing inflammation [6, 7]. Figure 1 shows as a triacylglycerol (TAG), including a glycerol backbone and three fatty acids (FA). The FA are attached to specific positions of the TAG, abbreviated sn-1, -2 and -3. The lipid digestion is very efficient. Approximately 95-98% of the lipids in the diet are absorbed in the small intestine [8, 9]. 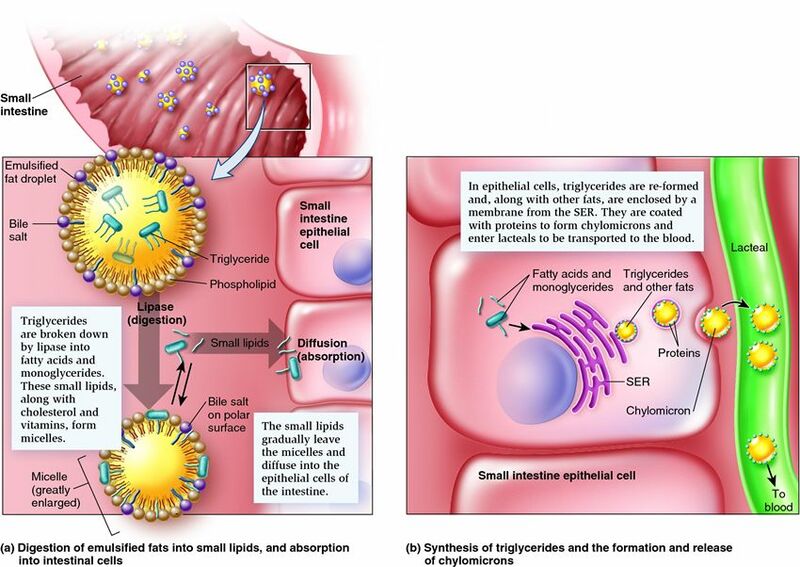 The dietary lipid complexes needs to be broken down into smaller pieces to be absorbed by the enterocytes, which are the cells lining the gut wall (fig. 4). Most, but not all, dietary lipids contain ester bonds that are easily hydrolysed by the lipases present in the gastro intestinal tract (GIT). Lipases are the enzymes which are responsible for the breakdown of lipid complexes described above, and overall necessary for the lipid digestion. They absorb to the droplet surface, hence the nature of the interfacial layer will determine rate and extent of lipid hydrolysis. Furthermore, the overall absorption of lipids are greatest in the upper small intestine due to the presence of surface active substances  which increases the number of mixed micelles. As the absorption of the surface active substances, for instance FFA and MAGs, proceeds, the overall lipolysis and absorption will be less efficient due to the decrease of the surface area of the lipid droplets. 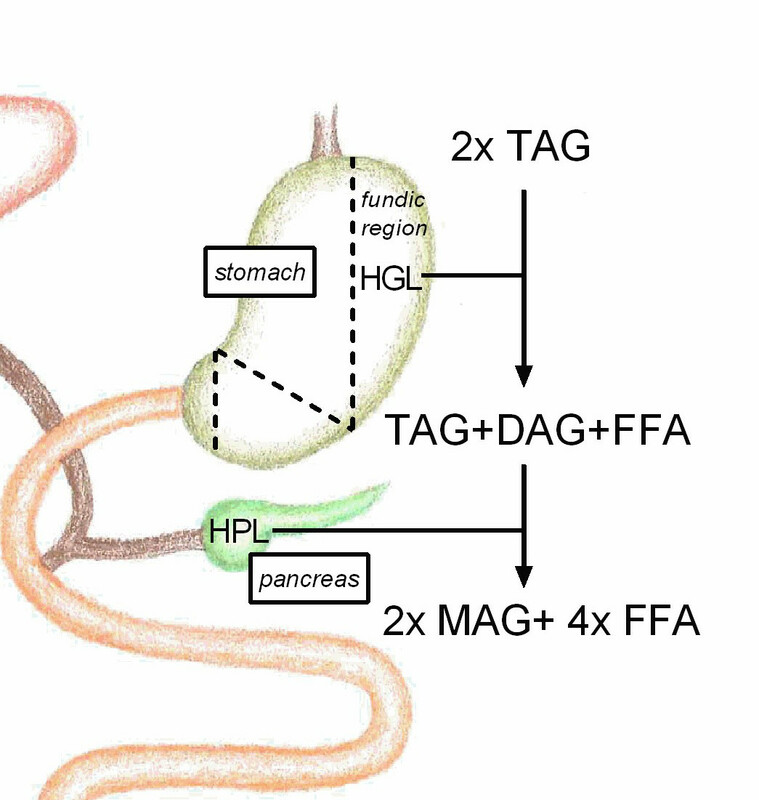 Since TAGs are the main lipid complexes that exist within foods, there are mainly two lipolytic enzyme systems that are important for an efficient lipid digestion, the gastric (HGL) – and the pancreatic (HPL) lipases [8, 13]. The relative contribution of HGL and HPL to the overall lipid hydrolysis, are approximately 10-30% and 70-90%, respectively (Fig. 2). However, there are also other lipases present in the GIT; like the pancreatic non-specific lipase (pancreatic carboxyl esterase), pancreatic phospholipase A2 (sPLA2)  and the pancreatic lipase related protein-2 (PLRP2). These lipases are responsible for hydrolysing other dietary lipid complexes, for instance phospholipids and galaktolipids . Furthermore, there are also other lipases which are found outside the GIT, for instance: hepatic (HL), lipoprotein (LPL) and endothelial (EL) lipases . The general function of these non-GIT lipases is to release FA from lipoproteins present in the bloodstream, making them available for absorption. The mouth is the first step of the food when entering the GIT. The mechanical forces of the grinding of the teeth will break down the food into smaller pieces. Furthermore, there will be secretion of saliva which is essential to lubrication of the food particles, making a food-bolus. The existence of lingual lipase originated in the mouth has previously been questioned. However, the cellular and tissue origins of the human preduodenal lipases has been established, showing no presence of this enzyme in humans . The breakdown of dietary TAGs starts in the stomach by the action of gastric lipase (HGL) , known to be stable and active at acidic pH, with a maximum activity at pH 5.0-5.4 . It hydrolyses FA from all three positions on TAGs , but has a specificity for sn-3 [13, 23]. On the basis of this, the lipolytic activity of the HGL mainly yields one free fatty acid (FFA)+ one diacylglycerol (DAG) [9, 13, 24, 25], with DAG being a lipid complex consisting of one glycerol backbone with two FA attached made when the lipases cuts loose a FA from one of the three positions on the glycerol backbone of the TAG (fig. 3). The HGL is responsible for up to 10-30 % of the total lipid breakdown within the GIT [13, 26-28] and the limited extent of lipolysis is suggested to be due to feedback inhibition by lipid products [9, 29]. Figure 3 shows the breakdown of triacylglycerols (TAGs) into Diacylglycerol (DAG) and one Free Fatty Acid (FFA) initiated by the gastric lipase. As the pre-digested food goes further into the first part of the small intestine, the duodenum, it is mixed with enzymatic pancreatic and bile [30, 31]. The main surfactants in bile is bile salts which are essential to disperse the hydrophobic lipid complexes within the water-rich environment of the small intestine, facilitating the release of FA from TAGs and DAGs by making the outer layer of the mixed micelles [9, 32, 33]. Other lipids from the bile, like phospholipids and cholesterol are also included in the formation of mixed micelles  (fig. 5). Furthermore will also the formation of FFA and MAG as a result of the action of the lipases towards the different positions on the TAGs help to increase the rate of emulsification. To sum up, emulsification of the lipid droplet will increase the surface area of the lipid droplets, thereby increasing the lipolytic action of the lipases . The enzyme secretion from the pancreas is stimulated both by the presence of food in the stomach, by hormones and as a reaction to sensory signals by the thought, sight or smell of food . Among the enzymes which are secreted upon these stimuli’s is the pancreatic lipase (HPL) . The HPL is the main enzyme responsible for lipolysis in the human GIT, responsible for hydrolysing about 98 % of the remaining dietary TAGs in healthy humans, facilitating an overall absorption of 95-98 % of the total lipid content from the food . The HPL has a preference for the FA located in the sn-1 and sn-3 position of TAGs [37, 38] yielding two FFA + sn-2 MAG [37, 39] (fig. 4). The HPL needs a co-enzyme, the colipase, as a mediator [40, 41] to exert its function. Colipase works by anchoring HPL to its substrate . As the digestion proceeds FA are released from the TAGs. Short and medium chained FA (2-12 C), which has a higher solubility in aqueous media, will increase the emulsification of lipid droplets by efficient solubilisation into mixed micelles. Whereas long-chained FA (LC FA) (>12C), which are more hydrophobic, will accumulate at oil-water interphase, somewhat inhibiting the enzymatic action of the HPL . However, as described above, the lipid digestion and absorption is extremely efficient. Consequently, this would only affect the rate of the lipolytic action, but not the overall lipolysis. In the small intestine, the micelles are important for transporting the hydrophobic core content formed by lipids with low water solubility, for instance; cholesterol, MAGs, and FFA, to the enterocytes for absorption [14, 33, 44]. When the mixed micelles reach the unstirred layer, the complex will be disabled due to a shift in pH, leading to a release of both the core content and the compounds forming the outer layer, among these the bile salts. The mechanism of uptake and absorption of FA is unclear, but it is suggested to be affected by the chain length of the FA. FAs containing <12 C could be bound to albumin, which is a protein with affinity for FA , making them water soluble. Consequently, these FA are free to passively diffuse through the epithelial cells lining the gut lumen [46, 47], further diffusing into the blood stream where they are transported to the liver via the hepatic vein. The LC FA (>12 C), which are more hydrophobic, are being transported across the cell membrane by the action of transport proteins [45, 48]. Inside the cell they will be resynthesized into TAGs within the endoplasmatic reticulum, before they are transported to the Golgi apparatus where they are combined with cholesterol, phospholipids and proteins, making a lipoprotein called chylomicron (CM) . Lipoproteins are transporter vehicles responsible for transporting the different amounts of cholesterol and TAGs, through the water rich environment of the blood and lymph from the origin to the site of destination. The solubility of the lipoproteins within the water rich environment of the blood stream is due to the coating of apo-lipoproteins. These specific proteins are important both as enzymatic cofactors and as markers for receptors. The markers help the different tissues and cells recognize the specific type of lipoproteins, making sure that their core contents are delivered at the right destination. As described above, CMs are responsible for transporting lipids derived from the diet to the cells in the tissue or the liver, dependent of the need for FA. As the TAGs are being removed and absorbed by the tissue, the CM loses its specific apolipoprotein making a CM-remnant (CM R), which is removed from the blood stream by the liver and further catabolized [51-53]. Lipids which are synthesized in the liver is packed into lipoproteins called very-low density lipoproteins (VLDL) and secreted into the peripheral circulation. As the TAGs are removed from the VLDL by the action of the lipases in the tissue, it is reduced to Intermediate-density lipoprotein (IDL) and further to low-density lipoprotein (LDL). LDL contains a small amount of TAGs, making the proportion of cholesterol large. Consequently, the main function of the LDL is to transport cholesterol to the peripheral tissue and the liver. High-density lipoprotein (HDL) is the lipoprotein which is responsible for the ‘reverse lipid transport’, transporting redundant cholesterol from the tissue back to the liver and the steroidogenic tissues for degradation and catabolization. Steriodogenic tissues beeing tissues which produces steroids within the human body. The cholesterol are, among others, used to synthesize bile acids [51-53], important for an efficient lipid digestion, as previously described. This section; Absorption and distribution of lipids, are summarized in figure 5. Figure 5 Overview of Lipid digestion and distribution of lipids, details are described in the text in chapter; 2.4 Absorption and distribution of lipids. ApoX, apolipoprotein; BS, bile salt; CE, cholesterol ester; Chl, cholesterol; CM, chylomicron; CM r, chylomicron remnant; DAG, diacylglycerol; EL, endothelial lipase; FFA, free fatty acid; HDL, high-density lipoprotein; HL, hepatic lipase; IDL, intermediate-density lipoprotein; LDL, low-density lipoprotein; LPL, lipoprotein lipase; MAG, monoacylglycerol; TAG, triacylglycerol; VLDL, very-low density lipoprotein. Figure derived from Aarak, K. E (2013) . The two n-3 PUFAs EPA and DHA have been shown to have several positive health implications, as previously described. However, “natural” food products have these FA in a relatively low proportion.. To increase the amount of n-3 PUFAs ingested a concentrations of these specific FA have been suggested. To do this the making of ethyl esters (EE) by transesterificate the FA, removing the glycerol backbone of the TAG introducing a ethanol instead, have been commonly employed . The digestion of TAGs by the pancreatic lipase (HPL) is described in detail above. The digestion of EE somehow differs from the digestion of TAG due to the missing glycerol backbone. To sum up; the EE are also dependent on the enzymatic activity of HPL to release the FA, as FA needs to be present as free fatty acids or monoacylglycerol to be absorbed. However, the linkage between the FA and the ethanol is more resistant to hydrolysis, making the overall release of FA from EE being less efficient compared to the release of FA from TAGs [55-57]. The bioavailability of n-3 PUFAs from EE and TAG have been investigated by numerous studies. A few studies have shown similar results when comparing the absorption from TAGs and EE [58, 59]. 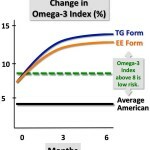 However, overall the studies conducted suggest that n-3 PUFAs in TAGs have an increased bioavailability compared to when they are present in EE[60-64].However, the enzyme output is in excess when digesting food, hence would not an increased intake of EE affect neither the efficiency nor the TAG hydrolysis. In a normal diet, phospholipids are making out approximately 1-10 % of the daily fat intake. Most of these phospholipids are phosphatidylcholine, which are also the second most abundant dietary lipid after triacylglycerols . However, there are also other phospholipids present in the dietary lipids; for instance phosphatidylethanolamine, phosphatidylserine and phosphatidylinositol. Phospholipase A2, which is the enzyme present in the gut lumen responsible for releasing FA from phospholipids, has a preference for the sn-2 of the phospholipid, and its lipolytic action leads to a formation of a free fatty acid + lyso PC. These components are absorbed as the components from the TAGs, and resynthesized into phospholipids within the enterocytes before they are released as parts of the chylomicrons [65,67]. Bioavailability is a term commonly used when investigating the absorption of nutrients, defined as the fraction of ingested components which are availiable for utilization in normal physiological functions, e. g. availiable in the blood stream . As previosly described, the lipid digestion and uptake are very efficient, however, several dysfunctions within the GIT might affect the efficiency of the absorption giving a secondary reaction called malabsorption. Malabsorption is defined as a pathological interference with the normal physiological sequence of digestion, absorption and transport of nutrients and electrolytes . This could be caused by several different dysfunctions within the GIT. For instance; intestinal causes, like pancreatic insufficiency meaning the production of digestive components (e. g. enzymes) are compromised, inflammatory bowel disease and intestinal resection; mucosal dysfunction, like coeliac disease and tropical sprue; lymphatic dysfunction, like lymphagiectasia, Whipple’s disease and filariasis; or through other physical changes within the GIT, like medicin increasing bile acid secretion or partial ileal buypass . When malabsorption occures this would commonly lead to a general deficiecy of macro- and micro nutrients giving classical malabsorption symptomes furthere described below. Malabsorption could be classified into three main groups based on the degree of the malabsorption; (1) selective, if the malabsorption only affects one specific micro nutriet; e.g lactose intolerance; (2) partial, when the malabsorption affects a group om macronutrients,e.g a-β-lipoproteinemia in babies which does not absorbe lipids and lipid-soluble vitamines as normal, and (3) total, when the function of the whole small intesine is impaired, e.g by celiac diseases. Symptoms of malabsorption of nutrients are also classified in two different categories, and are known to be intestinal, which are usually the most dominant symptoms, and extraintestinal. Intestinal symptoms compremise of; Chronic diarrhea, watery, diurnal and nocturnal bulky stool; Change in stool color, affected by fat content giving a pale, yellow floating, spongish stools. Observations needs to be confirmed by adequate examination of feces, and decal fat content should not exceed 7g/day, independent of total fat intake; Hyperphagia; Nausea; Vomiting; Abdominal distension; Excessive Flatus and abdominal discomfort, but not pain. Cramping would suggest the presence of obstricted intestinal segments, observed in diseases like Chrons’s diseases and malignancies. Extraintestinal symptoms could be; short stature; inferility, bone disease and hematological problems . Malabsorption of lipids would lead to deficiency of lipid soluble vitamine (A, D, E and K). Furthermore, lipid malabsorption has also shown to affect the absorption of essential FA (linoleic acid) in patients having gone through intestinal resection . As mentoned above, malabsorption would affect the absorption of nutrients in general. However, malabsorption of single have also previosuly been reported. Among these are the bile acids, known to be essential for lipid absorption, giving diarrhea when the concentration is >3mmol/l within the colon . Malabsorption could also be therapautical induced, for instance when decreasing serum lipids in patients with hyperlipidemia by the use of the pharmaceutical neomyzin or cholestyramine. This due to an overall reduction of lipid absorption from the small intestine. The effect would be more increased in subjects which has previously been through a ileal bypass, due to the decrease in lipid absorption. There is a lack of generally accepted biomarkers that reflects increased n-3 PUFA status in response to enhanced dietary intake. This has previously been emphasized as a problem when designing and carrying out clinical trials investigating the effect of the n-3 PUFAs supplementation in vivo. As summarized by Fekete et. al (2009) would a defined biomarker be essential to decide whether the negative outcome of a controlled trial, e. g. lack of functionally changes in response to supplementation, are related to either the clinical effect, lack of subject compliance or the inability of dietary intervention to evoke changes in the FA composition of relevant biological compartments within the body. Several compartments have previously been suggested, for instance different plasma lipids (TAGs, cholesterol esters, phospholipids and total plasma lipids), erythrocytes and adipose tissue. However, dose-response curve of incorporation into these compartments have previously been shown to differ [75, 76], suggesting that the choice of measurement might also affect the outcome of the study. Moreover, that observation obtained studying different compartments would be difficult to compare with each other. A review by Øverby et. Al (2009) did also suggest that the choice of compartment to analyse should be chosen based on the purpose and length of the study . For instance utilizing adipose tissue when assessing long-term FA intake [78, 79], erythrocytes when studying the incorporation of n-3 FA <120 days , and plasma lipids when studying the dietary intake for a shorter amount of time . However, plasma lipids have also been suggested to provide information for a longer period of time if the subjects are on a stable diet regime . Mu, H. and T. Porsgaard, The metabolism of structured triacylglycerols. Prog Lipid Res, 2005. 44(6): p. 430-48. Borgström, B., Luminal Digestion of Fats. 2 ed. The Pancreas: Biology, Pathbiology, and Disease, ed. e.a. Vay Liang W. Go. 1993, New York: Raven Press, Ltd.
Ackman, R.G., Some possible effects on lipid biochemistry of differences in the distribution on glycerol of long-chain n-3 fatty acids in the fats of marine fish and marine mammals. Atherosclerosis, 1988. 70(1-2): p. 171-3. Wang, C., et al., n-3 Fatty acids from fish or fish-oil supplements, but not alpha-linolenic acid, benefit cardiovascular disease outcomes in primary- and secondary-prevention studies: a systematic review. Am J Clin Nutr, 2006. 84(1): p. 5-17. Bjerve, K.S., et al., alpha-Linolenic acid and long-chain omega-3 fatty acid supplementation in three patients with omega-3 fatty acid deficiency: effect on lymphocyte function, plasma and red cell lipids, and prostanoid formation. Am J Clin Nutr, 1989. 49(2): p. 290-300. Hu, F.B., et al., Fish and long-chain omega-3 fatty acid intake and risk of coronary heart diseas and total mortality in diabetic women. Circulation, 2003. 107(14): p. 5. Calder, P.C., n-3 polyunsaturated fatty acids, inflammation, and inflammatory diseases. Am J Clin Nutr, 2006. 83(6 Suppl): p. 1505S-1519S. Armand, M., Lipases and lipolysis in the human digestive tract: where do we stand? Curr Opin Clin Nutr Metab Care, 2007. 10(2): p. 156-64. Carey, M.C., D.M. Small, and C.M. Bliss, Lipid digestion and absorption. Annu Rev Physiol, 1983. 45: p. 651-77. Fillery-Travis, A.J., L.H. Foster, and M.M. Robins, Stability of emulsions stabilised by two physiological surfactants: L-alpha-phosphatidylcholine and sodium taurocholate. Biophys Chem, 1995. 54(3): p. 253-60. Mun, S., E.A. Decker, and D.J. McClements, Influence of emulsifier type on in vitro digestibility of lipid droplets by pancreatic lipase. Food Research International, 2007. 40(6): p. 770-781. Westergaard, H. and J.M. Dietschy, The mechanism whereby bile acid micelles increase the rate of fatty acid and cholesterol uptake into the intestinal mucosal cell. J Clin Invest, 1976. 58(1): p. 97-108. Carriere, F., et al., Secretion and contribution to lipolysis of gastric and pancreatic lipases during a test meal in humans. Gastroenterology, 1993. 105(3): p. 876-88. Embleton, J.K. and C.W. Pouton, Structure and function of gastro-intestinal lipases. Advanced Drug Delivery Reviews, 1997. 25: p. 17. Eydoux, C., et al., Further biochemical characterization of human pancreatic lipase-related protein 2 expressed in yeast cells. J Lipid Res, 2007. 48(7): p. 1539-49. Amara, S., et al., Lipolysis of natural long chain and synthetic medium chain galactolipids by pancreatic lipase-related protein 2. Biochim Biophys Acta, 2010. 1801(4): p. 508-16. Birari, R.B. and K.K. Bhutani, Pancreatic lipase inhibitors from natural sources: unexplored potential. Drug Discovery Today, 2007. 12(19-20): p. 879-89. N’Goma, J.-C.B., et al., Understanding the lipid-digestion processes in the GI before designing lipid-based drug-delivery systems. Therapeautic Delivery, 2012. 3(1): p. 19. Moreau, H., et al., Screening of preduodenal lipases in several mammals. Biochim Biophys Acta, 1988. 959(3): p. 247-52. Hamosh, M., Lingual and gastric lipases. Nutrition, 1990. 6(6): p. 421-8. Gargouri, Y., et al., Kinetic assay of human gastric lipase on short- and long-chain triacylglycerol emulsions. Gastroenterology, 1986. 91(4): p. 919-25. Carriere, F., et al., Purification and biochemical characterization of dog gastric lipase. Eur J Biochem, 1991. 202(1): p. 75-83. Carriere, F., et al., Gastric lipases: cellular, biochemical and kinetic aspects, in Lipases: their structure, biochemistry and application, P. Woolley, Editor. 1994, Cambridge University Press: New York. p. 181-205. Patton, J.S., et al., Hydrolysis of triacylglycerol emulsions by lingual lipase. A microscopic study. Biochim Biophys Acta, 1982. 712(2): p. 400-7. Hayes, R.J., et al., Review of triacylglycerol digestion, absorption, and metabolism with respect to Salatrim triacylglycerols. J. Agric. Food Chem, 1994. 42: p. 474-483. Armand, M., et al., Characterization of emulsions and lipolysis of dietary lipids in the human stomach. Am J Physiol, 1994. 266(3 Pt 1): p. G372-81. Armand, M., et al., Physicochemical characteristics of emulsions during fat digestion in human stomach and duodenum. Am J Physiol, 1996. 271(1 Pt 1): p. G172-83. Armand, M., et al., Digestion and absorption of 2 fat emulsions with different droplet sizes in the human digestive tract. Emerican Journal of Clinical Nutrition, 1999. 70(6): p. 1096-106. Hamosh, M., D. Ganot, and P. Hamosh, Rat lingual lipase. Characteristics of enzyme activity. J Biol Chem, 1979. 254(23): p. 12121-5. Miled, N., et al., Digestive lipases: from three-dimensional structure to physiology. Biochimie, 2000. 82(11): p. 973-86. Borovicka, J., et al., Regulation of gastric and pancreatic lipase secretion by CCK and cholinergic mechanisms in humans. Am J Physiol, 1997. 273(2 Pt 1): p. G374-80. Reis, P., et al., Lipases at interfaces: a review. Adv Colloid Interface Sci, 2009. 147-148: p. 237-50. Hernell, O., J.E. Staggers, and M.C. Carey, Physical-chemical behavior of dietary and biliary lipids during intestinal digestion and absorption. 2. Phase analysis and aggregation states of luminal lipids during duodenal fat digestion in healthy adult human beings. Biochemistry, 1990. 29(8): p. 2041-56. Gargouri, Y., et al., Importance of human gastric lipase for intestinal lipolysis: an in vitro study. Biochim Biophys Acta, 1986. 879(3): p. 419-23. Keller, J. and P. Layer, Human pancreatic exocrine response to nutrients in health and disease. Gut, 2005. 54 Suppl 6: p. vi1-28. Porsgaard, T., et al., Differences in the intramolecular structure of structured oils do not affect pancreatic lipase activity in vitro or the absorption by rats of (n-3) fatty acids. Journal of Nutrition, 2005. 135(7): p. 1705-11. Mattson, F.H. and R.A. Volpenhein, The Digestion and Absorption of Triglycerides. J Biol Chem, 1964. 239: p. 2772-7. Rogalska, E., S. Ransac, and R. Verger, Stereoselectivity of lipases. II. Stereoselective hydrolysis of triglycerides by gastric and pancreatic lipases. Journal of Biological Chemistry, 1990. 265(33): p. 20271-6. Mattson, F.H., et al., Intermediates formed during the digestion of triglycerides. J Nutr, 1952. 48(3): p. 335-44. Borgstrom, B. and C. Erlanson, Pancreatic juice co-lipase: physiological importance. Biochim Biophys Acta, 1971. 242(2): p. 509-13. Morgan, R.G. and N.E. Hoffman, The interaction of lipase, lipase cofactor and bile salts in triglyceride hydrolysis. Biochim Biophys Acta, 1971. 248(1): p. 143-8. Freie, A.B., et al., Val-407 and Ile-408 in the beta5′-loop of pancreatic lipase mediate lipase-colipase interactions in the presence of bile salt micelles. J Biol Chem, 2006. 281(12): p. 7793-800. McClements, D.J., et al., Designing Food Structure to Control Stability, Digestion, Release and Absorption of Lipophilic Food Components Food Biophysics, 2008. 3: p. 219-228. Caspary, W.F., Physiology and pathophysiology of intestinal absorption. Am J Clin Nutr, 1992. 55(1 Suppl): p. 299S-308S. Stremmel, W., et al., A new concept of cellular uptake and intracellular trafficking of long-chain fatty acids. Lipids, 2001. 36(9): p. 981-9. Artursson, P., Epithelial transport of drugs in cell culture. I: A model for studying the passive diffusion of drugs over intestinal absorptive (Caco-2) cells. J Pharm Sci, 1990. 79(6): p. 476-82. Hamilton, J.A. and F. Kamp, How are free fatty acids transported in membranes? Is it by proteins or by free diffusion through the lipids? Diabetes, 1999. 48(12): p. 2255-69. Fitscher, B.A., et al., Protein-mediated facilitated uptake processes for fatty acids, bilirubin, and other amphipathic compounds. Proc Soc Exp Biol Med, 1996. 212(1): p. 15-23. Smith, W.L. and R.C. Murphy, The eicosanoids: cyclooxygenase, lipoxygenase, and epoxygenase pathways, in Biochemistry of Lipids, Lipopoteins and Membranes, 5th edition, D.E. Vance and J.E. Vance, Editors. 2008, Elsevier: Oxford, UK. p. 30. Aarak, K.E., Release of fatty acids from salmon oil and muscle during in vitro digestion – impact of a meal composition, in Institute of Chemistry, Biotechnology and Food Science. 2013, University of Life Sciences: Ås, Norway. Vance, J.E. and K. Adeli, Assembly and secretion of triacylglycerol-rich lipoproteins, in Biochemsitry of Lipids, Lipoproteins and Membranes, 5th edition, D.E. Vance and J.E. Vance, Editors. 2008, Elsevier: Oxford, UK. p. 26. Fielding, C.J. and P.E. Fielding, Dynamics of lipoprotein transport in the circulatory system, in Biochemistry of Lipids, Lipoprotein and Membranes, 5th edition, D.E. Vance and J.E. Vance, Editors. 2008, Elsevier: Oxford, UK. p. 22. Schneider, W.J., Lipoprotein receptors, in Biochemistry og Lipids, Lipoproteins and Membranes, 5th edition, D.E. Vance and J.E. Vance, Editors. 2008, Elsevier: Oxford, UK. p. 24. Mogelson, S., S.J. Pieper, and L.G. Lange, Thermodynamic bases for fatty acid ethyl ester synthase catalyzed esterification of free fatty acid with ethanol and accumulation of fatty acid ethyl esters. Biochemistry, 1984. 23(18): p. 4082-7. Yang, L.Y., A. Kuksis, and J.J. Myher, Lipolysis of menhaden oil triacylglycerols and the corresponding fatty acid alkyl esters by pancreatic lipase in vitro: a reexamination. J Lipid Res, 1990. 31(1): p. 137-47. Yang, L.Y., A. Kuksis, and J.J. Myher, Intestinal absorption of menhaden and rapeseed oils and their fatty acid methyl and ethyl esters in the rat. Biochem Cell Biol, 1990. 68(2): p. 480-91. Dyerberg, J., et al., Bioavailability of marine n-3 fatty acid formulations. Prostaglandins Leukot Essent Fatty Acids, 2010. 83(3): p. 137-41.
von Schacky, C. and P.C. 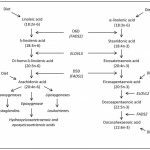 Weber, Metabolism and effects on platelet function of the purified eicosapentaenoic and docosahexaenoic acids in humans. J Clin Invest, 1985. 76(6): p. 2446-50. Terano, T., et al., Effect of oral administration of highly purified eicosapentaenoic acid on platelet function, blood viscosity and red cell deformability in healthy human subjects. Atherosclerosis, 1983. 46(3): p. 321-31. Visioli, F., et al., Dietary intake of fish vs. formulations leads to higher plasma concentrations of n-3 fatty acids. Lipids, 2003. 38(4): p. 415-8. Ikeda, I., et al., Digestion and lymphatic transport of eicosapentaenoic and docosahexaenoic acids given in the form of triacylglycerol, free acid and ethyl ester in rats. Biochim Biophys Acta, 1995. 1259(3): p. 297-304. Valenzuela, A., et al., Effect of supplementation with docosahexaenoic acid ethyl ester and sn-2 docosahexaenyl monoacylglyceride on plasma and erythrocyte fatty acids in rats. Ann Nutr Metab, 2005. 49(1): p. 49-53.
el Boustani, S., et al., Enteral absorption in man of eicosapentaenoic acid in different chemical forms. Lipids, 1987. 22(10): p. 711-4. Cohn, J.S., et al., Dietary phospholipids and intestinal cholesterol absorption. Nutrients, 2010. 2(2): p. 116-27. Phan, C.T. and P. Tso, Intestinal lipid absorption and transport. Front Biosci, 2001. 6: p. D299-319. Mansbach, C.M., 2nd and F. Gorelick, Development and physiological regulation of intestinal lipid absorption. II. Dietary lipid absorption, complex lipid synthesis, and the intracellular packaging and secretion of chylomicrons. Am J Physiol Gastrointest Liver Physiol, 2007. 293(4): p. G645-50. Guerra, A., et al., Relevance and challenges in modeling human gastric and small intestinal digestion. Trends Biotechnol, 2012. 30(11): p. 591-600. Bai, J.C., Malabsorption syndromes. Digestion, 1998. 59(5): p. 530-46. 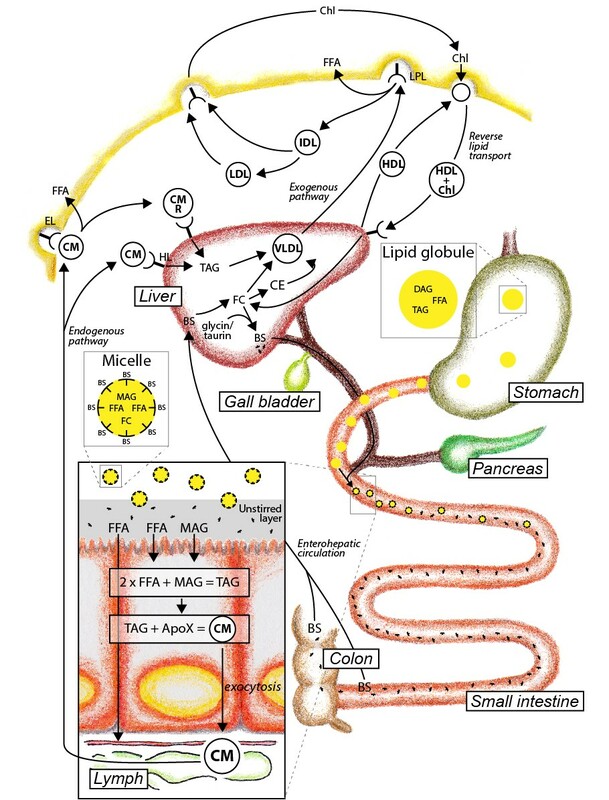 Thompson, G.R., Lipid related consequences of intestinal malabsorption. Gut, 1989. 30 Spec No: p. 29-34. Corazza, G., et al., Gliadin immune reactivity is associated with overt and latent enteropathy in relatives of celiac patients. Gastroenterology, 1992. 103(5): p. 1517-22. Press, M., et al., Diagnosis and treatment of essential fatty acid deficiency in man. Br Med J, 1974. 2(5913): p. 247-50. Fromm, H. and M. Malavolti, Bile acid-induced diarrhoea. Clin Gastroenterol, 1986. 15(3): p. 567-82. Fekete, K., et al., Methods of assessment of n-3 long-chain polyunsaturated fatty acid status in humans: a systematic review. Am J Clin Nutr, 2009. 89(6): p. 2070S-2084S. Brown, A.J., E. Pang, and D.C. Roberts, Persistent changes in the fatty acid composition of erythrocyte membranes after moderate intake of n-3 polyunsaturated fatty acids: study design implications. Am J Clin Nutr, 1991. 54(4): p. 668-73. Tremoli, E., et al., Prolonged inhibition of platelet aggregation after n-3 fatty acid ethyl ester ingestion by healthy volunteers. Am J Clin Nutr, 1995. 61(3): p. 607-13. Overby, N.C., L. Serra-Majem, and L.F. Andersen, Dietary assessment methods on n-3 fatty acid intake: a systematic review. Br J Nutr, 2009. 102 Suppl 1: p. S56-63. Knutsen, S.F., et al., Comparison of adipose tissue fatty acids with dietary fatty acids as measured by 24-hour recall and food frequency questionnaire in Black and White Adventists: the Adventist Health Study. Ann Epidemiol, 2003. 13(2): p. 119-27. Arab, L., Biomarkers of fat and fatty acid intake. J Nutr, 2003. 133 Suppl 3: p. 925S-932S. Sullivan, B.L., P.G. Williams, and B.J. Meyer, Biomarker validation of a long-chain omega-3 polyunsaturated fatty acid food frequency questionnaire. Lipids, 2006. 41(9): p. 845-50. Hodge, A.M., et al., Plasma phospholipid fatty acid composition as a biomarker of habitual dietary fat intake in an ethnically diverse cohort. Nutr Metab Cardiovasc Dis, 2007. 17(6): p. 415-26. Ottestad, I., et al., Oxidised fish oil does not influence established markers of oxidative stress in healthy human subjects: a randomised controlled trial. Br J Nutr, 2012. 108(2): p. 315-26. Prolonged inhibition of platelet aggregation after n-3 fatty acid ethyl ester ingestion by healthy volunteers.